This is a good post to read before you go. It will help you make a conference plan to maximize your weekend. There’s a lot you can get out of a WordCamp, so let’s help you decide what that is! Before I leave for a conference, I always start by understanding what sorts of people will attend. Depending on the city, a WordCamp will have 50 to ~1000 folks attending. This will include expert WordPress developers and designers, site owners, marketers, sponsors, and complete and total noobs. A common misconception is that WordCamps are for expert users, but that’s not true! WordCamps are perfect for newbies just getting started. Which of those four goals fits your current goals? As you think about that, it becomes easy to make a conference plan, but you’ll still have some basic questions about the conference. What should I wear to a WordCamp? Follow the culture of the conference. WordCamps are casual affairs. Shorts, graphic t-shirts, and even flip-flops are going to be acceptable at most WordCamps. Think open-source or startup software developers dresscode. That means dress in a way that makes you comfortable. As long as you don’t show up in a suit and a tie, you’ll fit right in. Should I bring my laptop to the event? Yes. Every screen you have that can tweet, email, post blogs, whatever, bring it. You want to be able to interact with your WordPress site while you’re there. For example, you may want to ask questions at the Happiness Bar, and make changes to your site on the spot! What about Twitter? Tweet every chance you get. Find out what the event hashtag is, and start sharing the highlights from each talk you go to, or tweet hi to the people you’ve just met in person. Twitter is an amazing way to keep in touch with all those people long term, and you’ll gain some followers along the way. Can I meet developers and designers at a WordCamp? WordCamps are amazing places to meet potential developers for a WordPress site. If you need a developer for a project, set a goal to meet 5 developers (which should be easy), get their contact info, and then discuss your project over email with them. How can I learn to develop a business on WordPress? WordCamps are designed to freely spread information, so it’s an appropriate place to come and ask questions about how to use WordPress for your business. This year at WordCamp Austin, I met some marketers who came with a set of objectives they wanted to achieve for a new site. They knew some of the the objectives could be met with plugins, and wanted advice about which plugins were optimal. For example, which plugin should they use to collect emails? Or, which plugin will add a social network aspect? These folks weren’t shy about asking for help, and you shouldn’t be either! If you can do all the work yourself, awesome! If you need help implementing a solution, ask them what their rates are! Should I give advice to other folks? Helping people start something by giving them advice or insight at a WordCamp is good karma, and it will always come back to you in spades. If you have expertise in something, share it with the community. What about after parties? My rule on after parties is to go if you have the energy left. You’ve already invested the time and money to attend the conference, so you should take advantage of everything offered. You never know who you will meet. I typically organize an impromptu after-after party, as long as it doesn’t conflict with the official party (Check with the organizers!). Recently, I helped set up “CigarCamp” after this years WordCamp in Austin. Should I speak at WordCamp? The answer to this question is always yes. If you have a topic that you’re an expert on, and it relates to WordPress, or it provides value to people who are using WordPress to create things, then you should always submit a topic. Speaking is one of the best ways to build your brand and your business. There you go. 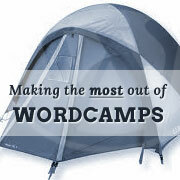 That’s a good overview of how to make the most out of WordCamps. If you think I missed something, or you’ve got another tip for other folks, leave it in the comments! We’ll read all of them. Austin Gunter (@austingunter) is the Brand Champion and Blogger over at WP Engine. WP Engine offers superfast managed WordPress hosting for huge popular sites, as well as small business owners who prioritize customer experience online.